If you've been anywhere around social media in the past month, you have probably seen tweets, posts, and pictures boosting the signal of the #WeNeedDiverseBooks campaign. The mission statement of the campaign is simple: something has to be done about the lack of diversity in children's literature. What started as a grassroots effort by a group of writers, publishers, and readers skyrocketed into a movement with coverage in places like Salon and LA Times. The outpouring of voices was so fantastic that BookCon even created a special panel in response. It was during this amazing movement that the author Kate Messner came up with The Great Greene Heist Challenge - a way for those who support diverse children's literature to make their voices heard by buying a copy The Great Greene Heist by Varian Johnson - by buying so many copies the book became a NY Times Bestseller. Before long, independent bookstores across the country were getting involved by challenging each other to sell as many copies as possible. Publishers Weekly covered the challenge and Johnson has a running list of participants and prizes on his website. YOU can participate in this movement by pre-ordering your own copy of The Great Greene Heist, which will be released next Tuesday. And here's the best part: The Great Greene Heist is worthy of all this attention and acclaim because it's a truly wonderful book. What makes The Great Greene Heist so darn fun? 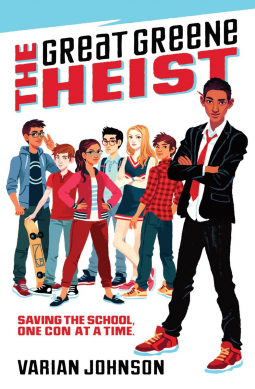 Well, there's the impossible to resist premise: it's Ocean's 11 set in a middle school (which, yes, is the perfect pitch if you're booktalking this book to librarians and other adult readers as I've been doing for months!) But kids won't care about that reference, what they WILL care about is that this is a just plain fun con story with a motley cast of characters coming together to use their unique talents - from computer hacking to clever reporting skills - for the greater good. Fun - you'll notice that I used that word twice. It's no accident. There's much to love about The Great Greene Heist, from the utterly realistic diversity of the cast to the crackerjack plotting, but for me the element that stands out the most is the fun. There's a real delight in any kind of well-executed con story, the pleasure of seeing it unfold and connect in all the right ways, and Johnson's pacing is perfect. There are just enough clearly explained steps in each twist to keep the reader frantically flipping pages in an effort to reveal the next one. And that makes the experience of reading about the con, and all the backstory that goes into expanding on why Jackson Greene and his crew are pulling it off, just plain fun. The fun element makes this a great book for pleasure reading but it's the successful narrative construction that makes it admirable on a craft level. The best con stories have to make you believe they could be done and not leave you feeling cheated and The Great Greene Heist never feels like it's pulling one over on the reader. Instead, it makes the reader feel like they can see what's happening behind the curtain - that they are in on it. This is a huge draw for middle-grade readers, it's a certain kind of narrative sophistication that moves them forward from early chapter books and places them firmly in middle grade territory. The Great Green Heist deserves to be a best-seller for a lot of reasons. Yes, one of them is to show the publishing industry that #WeNeedDiverseBooks can be backed up with sales - that a book with a multi-cultural cast that shatters stereotypes (did I mention the crackerjack science nerd is also the perky blonde cheerleader?) and a sauntering black kid on the cover can sell and sell and find a wide, eager readership. But another reason is simply because this is a great book, an original book, a well-constructed book, a fun book, and a darn clever book that will engage and satisfy, middle grade readers. So, now is your chance! You can become involved in the #WeNeedDiverseBooks movement. Follow the Tumblr and Twitter, like them on Facebook. Look for these books, buy them, promote them. And get in on The Great Greene Challenge! Contact your local indie bookstore, make sure they're going to be stocking it. Pre-order it for yourself or to give as a gift. If you can't buy one for yourself, make sure your public and school library has it on order for their shelves. It's one caper you'll be glad you took on and, believe me, Jackson Greene's crew is going to be one kids are going to wish they were part of. Awesome recommendation! I'll add it to my list!